Future Market Insights has announced the addition of the “Calcium Sulphate Market: Construction Industry Maintains the Lion’s Share in Terms of Consumption: Global Industry Analysis 2013 - 2018 and Opportunity Assessment 2019 - 2027" report to their offering. Valley Cottage, United States - February 21, 2019 /MarketersMedia/ — According to a recent study of Future Market Insights (FMI), global sales of calcium sulphate surpassed 285 thousand tons in 2018, and will record a 3.5% Y-o-Y growth in 2019. The study estimates construction industry to account for over 75% of overall calcium sulphate sales in 2019. While calcium sulphate has traditionally witnessed substantial adoption in the construction sector, there has been a significant increase in demand for calcium sulphate in paints & coatings, and industrial wastewater treatment applications in the recent past. Steady growth prospects have been estimated for hydrated calcium sulphate sales in 2019, in contrary to anhydrous calcium sulphate. . This can be attributed to robust adoption of hydrated calcium sulphate in various construction applications, including coloring pigments and quick drying PoP. Sales of hydrated calcium sulphate will be 4X more than their anhydrous counterparts in 2019, according to FMI study. Continued adoption as a supplement in the food & beverage industry, as fillers and coating agents in paper industry, continue to remain other leading demand determinants of hydrated calcium sulphate. Growing availability of effective and economically feasible alternatives, such as aluminum sulphate and calcium chloride, continue to remain key concerns for players operating in the calcium sulphate market. Leading players in the market have already shifted their preference toward calcium sulphate substitutes, in light of their greater efficacy and convenience in manufacturing. Regulatory standards imposed on calcium sulphate by the Environmental Protection Agency (EPA), and National Institute for Occupational Safety and Health’s (NIOSH), have significantly driven adoption of calcium sulphate alternatives. 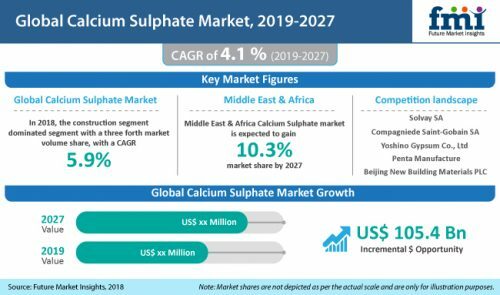 Additionally, better functionalities and performance outcomes apropos of using calcium chloride in construction applications, and aluminium sulphate in pharmaceutical and personal care product formulations, continues to pose a negative influence on sales of calcium sulphate worldwide. Application of calcium sulphate in topsoil layer for improved crop yield has traditionally been a common practice among farmers worldwide. However, regulatory hurdles regarding use of gypsum, composed of calcium sulphate, have been arresting adoption of calcium sulphate in the agricultural industry. Additionally, reuse and recycling of calcium sulphate by-products has emerged as a popular trend in recent years, which in turn will impede demand for calcium sulphate in the near future. . Leaders in calcium sulphate market such as Solvay S.A., Honeywell International Inc., and USG Corporation are currently focusing on investments in the development of low-cost sustainable gypsum boards, in line with the rise of green building initiatives that necessitate adoption of eco-friendly construction materials.